Ambassadors are highly visible, prestigious volunteers who serve as the Chamber’s primary liaison to new Chamber members. Considered the goodwill arm of the Chamber, the Ambassador committee plays an essential role in member recruitment, communication and retention, and each Ambassador is charged with conveying member needs, questions and concerns to Chamber staff, keeping our Chamber in line with our members’ desires. Upon their appointment, each Ambassador makes a commitment to build lasting relationships with the membership, particularly new Chamber members, in order to build a loyal, committed membership base that will continue to support, participate and invest in the Chamber. Ambassadors commit to spending approximately 6 hours per month on their duties as Chamber volunteers. Interested in learning more about becoming an Ambassador? 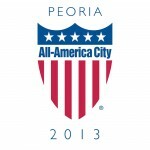 Contact Suzy Watkins at swatkins@peoriachamber.org for more information. Apply to become an Ambassador by filling out the application below.